For additional information about this book, visit the website www.awondrousjourney.com. A Wondrous Journey shows us what can occur when action is taken. When photographer Lynn Cluess Manzione decided to take on a project to counter what certain media are portraying as “women worthy of our attention,” she found herself on an incredible journey. Manzione traveled through time with Dr. Martha MacGuffie, a retired surgeon and eighty-six-year-old humanitarian whose poignant story not only achieved the photographer’s mission to show that beauty is heart and soul deep, but also offered wonderful life lessons along the way. 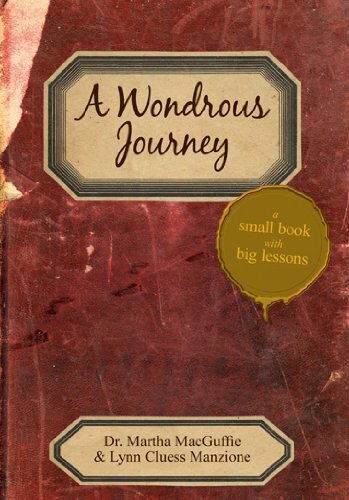 A Wondrous Journey is the chronicle of Dr. MacGuffie's inspiring life story — one of triumph, loss, and profound compassion. It is also a journey of self-discovery for Manzione, which leads to what they both share on the pages of this small book with big lessons. Dr. Martha MacGuffie, Bobby as she prefers, is a plastic and reconstructive surgeon, mother, grandmother, great grandmother, sister, friend, animal lover, activist, humanitarian, tireless octogenarian, excellent role model, teacher, and a force to be reckoned with. She resides in Rockland County, New York, in the home that she loves with her faithful companion Teddy. Lynn Cluess Manzione is a mother, wife, daughter, sister, friend, photographer, writer, promoter of positive role models, volunteer, student, teacher, and, since meeting Bobby … evolving into more. She resides a few miles away from her good friend Bobby with her husband Gregg, their sons James and Jesse, and her favorite dog Pepper.